While the rest of the vehicles in Acura’s lineup are scavenging what they can to remain relevant in their respective categories, Honda’s luxury division currently delivers a one-two SUV force that begs to be reckoned with. Essentially, even if Acura were to restrict its lineup to only the RDX and MDX, it would still remain a strong player in the industry. 106,181. That’s how many of the darn things Acura has pumped out of its Ohio assembly plant last year combined. While the compact RDX just recently underwent a thorough redo, we’re still left with the tried and tested MDX format for another year or so. But it’s not like that’s an issue, because what’s been hanging around the block for a while now, albeit showing its age, is still so good and so well packaged, that it remains a no-brainer purchase for families desiring upmarket comfort and space. The Sport Hybrid model just happens to add a bit of hybrid tech to the recipe for extra taste. That hybrid system, revolutionary when it was first introduced in the RLX back in 2014, and used to power the NSX supercar, is already becoming ho-hum compared to some current plug-in hybrids, notably Honda’s own Clarity. But we admire Acura’s willingness to market it as a performance-increasing system first-hand, whose effects can actually be felt behind the wheel. It incorporates no less than three electric motors that get their juice from an autonomous-charging, 1.3-kWh lithium battery pack. One of these motors is squeezed up front between the naturally aspirated, 3.0-litre V6, and two of them are nestled within the rear axle, powering each wheel, and allowing the MDX to remain all-wheel-drive all while adding a little torque vectoring twist to its already competent chassis. The vehicle will drive in fully electric mode for short distances and up to about 60 km/h, but it still heavily relies on the gas engine as a main source of propulsion. Total power output is rated at 321 hp (versus 290 hp in the regular vehicle) and 289 lb.-ft. of torque. A seven-speed dual-clutch automatic takes care of putting the power down. Equipped this way, Acura says its seven-passenger rig will sprint to 100 km/h from a standstill in just under six seconds, or about 0.2 seconds faster than its gasoline-only counterpart. The MDX is one of our favourite seven-passenger SUVs to fling down a curvy road. Its chassis is solid, the V6 engine emits satisfying intake snarls, the suspension is compliant and there’s a feeling of lightness and balance, typically found in Honda products, that makes the MDX a pleasant vehicle to drive at any speed. That Super Handling All-wheel Drive, complemented by the hybrid system, gives it some rather sticky shoes, too, generating significantly high levels of grip around corners, something that can’t exactly be said from some competitors such as the Volvo XC90 T8 plug-in hybrid and Toyota Highlander hybrid. Sadly, we weren’t so convinced by the results at the pump. Sure, we recorded a 9.2 L/km combined city/highway average. For a seven-passenger SUV, that’s very good, but not more so than the Volvo, which will pull some low eights. And considering that a conventional MDX will hang in the high tens when driven accordingly, we wonder if the $16,000 price premium over a standard MDX is worth the shot. Acura’s system, while technologically appealing, comes through mostly as a tech demo than an actual green proposition. Also, the fact that it can’t be plugged in restricts the Sport Hybrid from being eligible to any form of government rebate, nor can it be driven in carpool/EV reserved lanes. 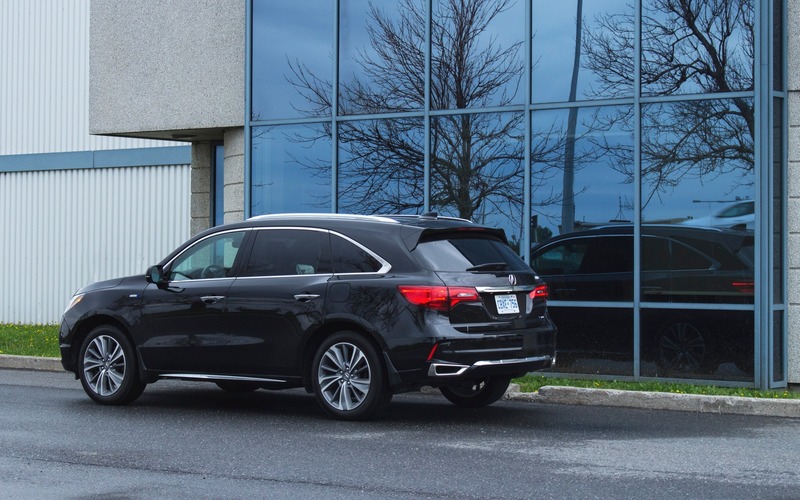 As for addressing family duties, the MDX is one of the most accommodating large SUVs on the market. 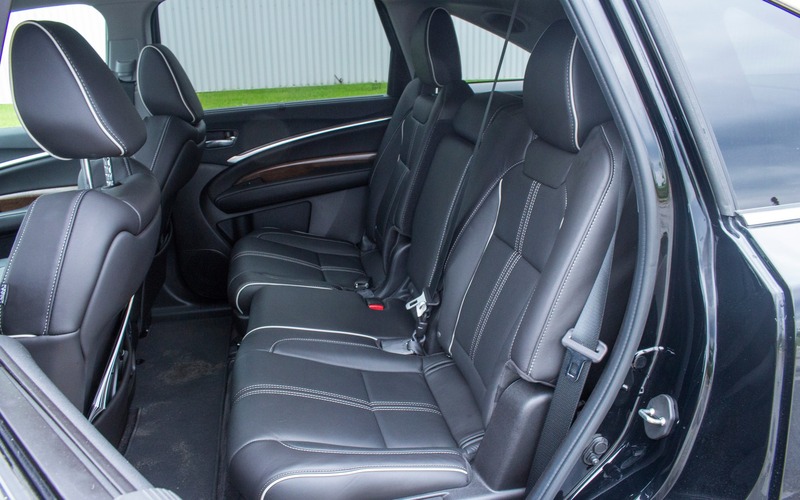 Its cabin is roomy, well put together, filled with storage, and all seats are comfortable, except for that rear bench that’s a tight fit for adults. Meanwhile, cargo space remains a tad on the tight side compared to some of the MDX’s main rivals. While a 447-litre trunk is close to that of an Audi Q7 (419 litres) and an Infiniti QX60 (447 litres), once those rear seats are all folded flat, the MDX sits in the less spacious side of the segment at 1 937 litres of available space. In comparison, both the Audi (2 027 litres) and the Infiniti (2 166 litres) give way to slightly larger cargo areas. Where the MDX wins, however, is in its value proposition. With a starting price of $52,250, it easily undercuts a Lexus RXL, an Audi Q7 and a Volvo XC90 by quite a margin. Only the Infiniti QX60 is a tad less expensive, but its driving dynamics and reliability scores are nowhere near that Acura’s. In simple words, while we’re not convinced by what the Sport Hybrid offers at the pump, it’s nevertheless a cool performance upgrade that proves once again that Acura has a technological edge on its competition. 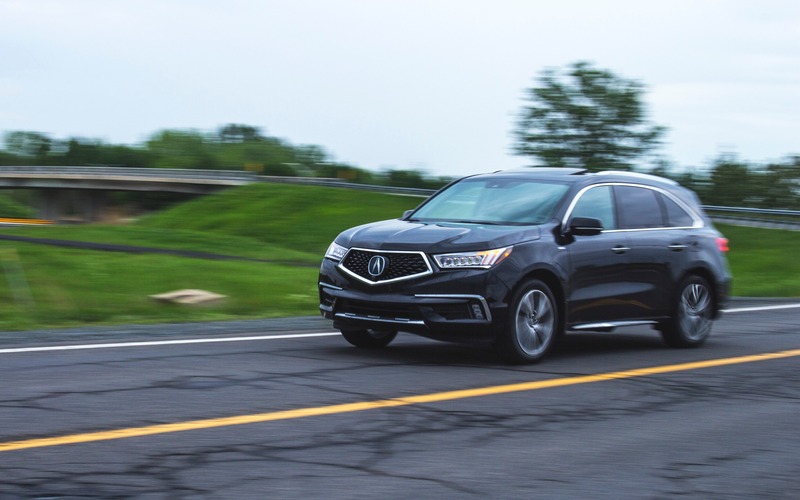 As for the standard MDX, if you stay in the lower trim levels, it’s still one of the best all-around luxury seven-passenger offerings currently available. 8/10	We recorded a 9.2 L/100 km average. For a seven-passenger SUV, that's excellent, but some of its hybrid competitors pull better numbers. 7/10	The cabin is spacious, seats are comfortable front and rear, but the third row is a little cramped. 9/10	The MDX Sport Hybrid is a quick and supremely athletic SUV for the price. 5/10	Android Auto and Apple CarPlay are finally available, but the system remains complex and not all that intuitive. 8/10	Nimble, light on its feet and quick enough. The MDX is one of our favourite SUVs to fling down a country road. 7/10	While the Sport Hybrid trim does little to impress us at the pump, it adds to the MDX's already competent driving dynamics. The MDX itself, while showing its age, remains a strong value proposition in the segment.